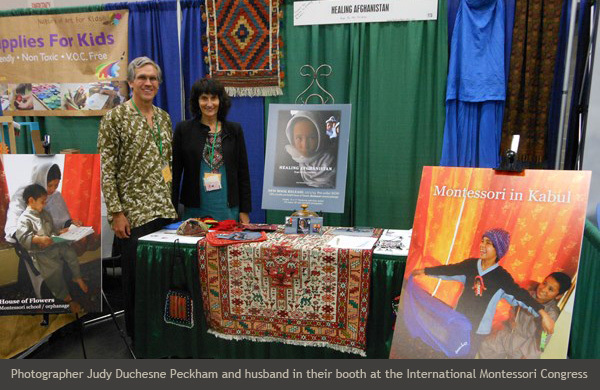 The International Montessori Congress, held July 31- August 1, 3013 in Portland, OR, attracted a wide swathe of people interested in education, with this year’s theme “Montessori: Guided by Nature.” Attendees came together from around the globe to discuss issues and developments unique to educating children, with 45 countries represented. Photographer/educator Judy Duchesne-Peckham attended the Congress to introduce her soon-to-be-released book of photographs and essays titled Healing Afghanistan: Hope for the Children. Her book focuses on the House of Flowers Orphanage/Montessori School in Kabul, the only Montessori school in Afghanistan, based on teaching, nurturing and healing. 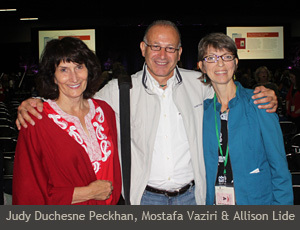 International attendees from nearly every continent, including House of Flowers co-founders Dr. Mostafa Vaziri and Allison Lide, presented and attended programs highlighting the benefits and successes of Montessori programs around the world. 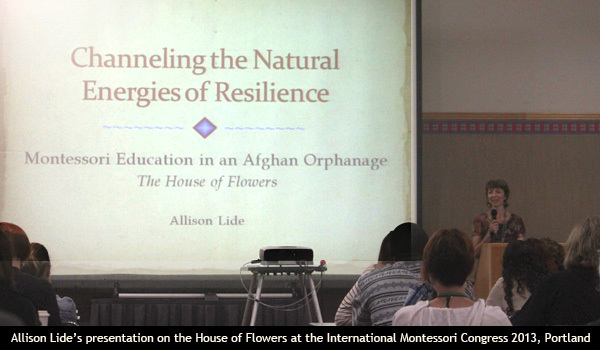 Allison presented an inspirational, well-attended lecture titled “Channeling the Natural Energies of Resilience,” where she discussed the successful 10 year journey of the children at the House of Flowers. Last October, she returned to Kabul to begin a Montessori pilot program for teachers in the government-run orphanages where conditions are notably grim. 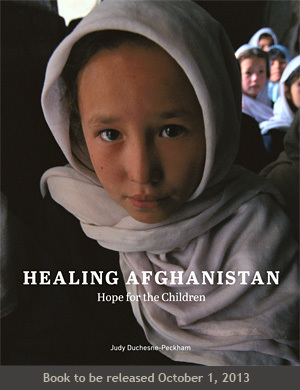 For more details and updates on Judy’s book, please consult the website: www.healingafghanistan.com. 100% of the profits from book sales will benefit The House of Flowers. thank you for your interest and comments. Can you provide more detail about how you would use/reference our points, so we can better understand. We are open to sharing, but we do try to always provide proper credits on our posts for content sources/creators.